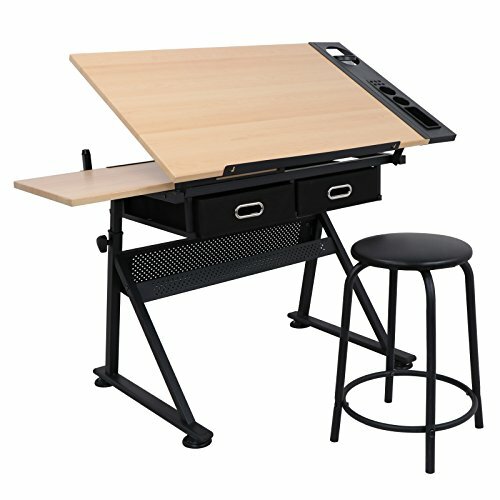 - This drawing desk is specially designed for creative use, the table is the perfect for workspace for arts and crafts projects, sketching, drafting and more. - Made from durable, heavy gauge steel, the desk features a 24" x 15" extended work surface as well as a 24" slide-up pencil ledge. - With ample storage space (thanks to a built-in art tray and cup holder as well as an under-table shelf and drawers), you can keep all of your supplies safely within reach. Its large work surface has one-hand tilt so you can adjust your work up to a 45-degree angle, and there's an additional flat surface that expands your available space. The height can be adjusted to 6 levels, 27.95"-29.53"-31.1"-32.68"-34.25"-35.83"
If you have any questions about this product by BBBuy, contact us by completing and submitting the form below. If you are looking for a specif part number, please include it with your message.